As the second part of my post about industry on the River Meon, today I am looking at brick making, which, like iron working, was, for centuries, carried out principally around the lower reaches of the Meon, at Titchfield and a little further upstream at Funtley, but also in other locations along the valley. The first brick-makers in Hampshire were the Romans, who used the local clay to make roof tiles, bricks and hollow tiles for their hypocaust central heating systems. Roman bricks were more like thick floor tiles, about 18 in. (45 cm) by 2 in. (5 cm). Although the Romans were the first to make bricks in England, it seems that the craft died out once they left in the 5th century. Then, after the Normans came in the 11th century, bricks were imported from Flanders but, gradually, brick-making became established again in England, and by 1330 there were at least twenty makers. They were known as “wall-tylers”, and not generally “bryke makers” until about 1430. The “tyles” used for wall construction were typically rather thin bricks, similar to those Roman floor-tile style bricks. Medieval craftsmen were of course obliged to join guilds, initially church guilds and later specific craft guilds, which controlled wages, apprenticeships and the quality of work. For tilers and brick-makers (who were also builders) the earliest such specific guild, the Worshipful Company of Tylers & Bricklayers, was founded in 1416, chartered by Elizabeth I in 1568 and, by 1600, was the country’s principal brick-makers’ guild. The company still survives. 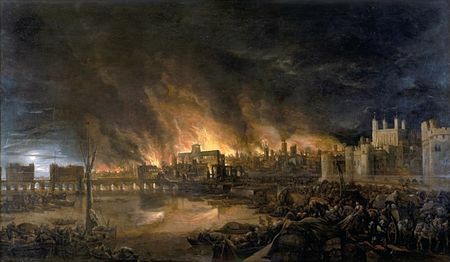 After the Great Fire of London of 1666, the king, Charles I, decreed that all new buildings in the city had to be built of fireproof materials. There was so much work to be done that the Tylers’ Guild did not have enough brick-makers in the London area to do it, and began to train people from the provinces. These new brick-makers eventually went back to their villages and set up hundreds of new brick-making businesses around the country. Nearly all brick-makers were itinerant, going to the construction sites to make the bricks using the local clay. appeared on the evening of Tuesday, 4 September 1666 from a boat in the vicinity of Tower Wharf. 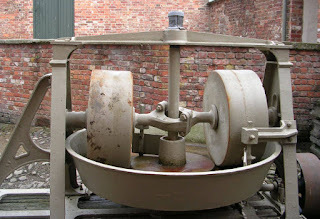 Improvements in transport, with canals and, later, railways, and then the development of steam power, in the first half of the 19th century, eventually brought mechanisation to brick-making. Machinery was developed to speed up the process, and permanent brickyards were established, producing thousands of bricks a day. By 1850 the majority of brick-makers were using mechanised brick production. But the small country businesses, unable to invest in machinery, were either bought out or closed, and itinerant brick-makers could not compete with the big factories. By 1914 there were probably no more than fifty travelling brick makers in the British Isles. Prior to World War Two, this reduced to half a dozen and today there seems to be only one, Tony Mugridge in Shropshire (http://www.ajmugridge.co.uk). Today, nearly all brick manufacture is carried out in permanent brickworks. For most of the period up to the middle of the 19th century, brick-makers were itinerant. Because bricks were heavy and roads were poor, it made sense to make the bricks close to the construction sites and the makers generally travelled to the sites and made bricks from whatever local clays were available. Brick-making was also essentially a seasonal occupation. The clay was dug out during the autumn and left to weather over winter, to break it down into lumps. Then, in the spring, it could be cleaned of stones and other debris and the brick-making process began. The method used was to immerse the clay in water, then beat it in some way to remove any air before shaping it into wooden moulds and leaving them to dry in the open air, perhaps for up to three months, depending on the weather and the time of year. The bricks were then stacked to form a simple kiln, a fire lit inside and the bricks “burnt”. After a few days’ firing, the kilns were allowed to cool naturally before being dismantled and the bricks were then stacked ready for use. The beating of the clay seems to have been done either by treading (puddling) by barefoot labourers, or by hand throwing. It must have been a very physically demanding and tiring task, and one that was apparently sometimes done by children. Children were also employed in moving bricks around the site. It must have been horrifically hard work. However, at some point in the 19th century, the pug mill was invented, a machine in which the clay was mixed with water mechanically and then beaten with paddles to produce the right consistency for making bricks. The colour and texture of bricks depended largely on the composition of the local clay and the fuels and additives used to fire them. So, for example, the presence of iron oxide gave a red colour to a brick, whereas limestone or chalk gave a yellowish colour. Historically, the size of bricks varied according to the moulds used by the travelling brick-makers. Initially, size didn't really matter, as many of these bricks were used in panels in timber-framed buildings. However, in 1784, the government introduced a "brick tax", initially 4s for a thousand bricks, used to help pay for George III's wars in America. To mitigate the effect of the tax, brick-makers began to increase the size of their bricks, but the government responded by introducing a maximum volume for a brick. One of the consequences was that some small brick-makers went out of business, forced to sell their stock to meet tax bills. But it also had an effect on house design with some areas returning to the use of timber and weatherboarding, or "brick tiles" to imitate brickwork on a timber-framed building. The level of taxation was increased three times before it was eventually abolished in 1850, when it was understood to be detrimental to industrial development. Brickworks were of considerable importance in the Meon Valley during the medieval period and for centuries afterwards, especially in the Titchfield area. 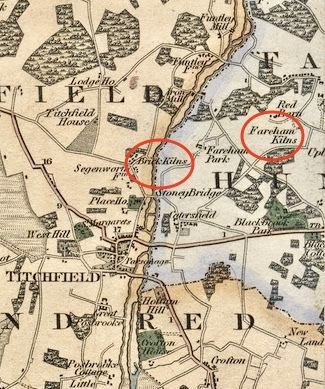 Traces of them can be seen in the brick kilns shown on the 1826 Greenwood map of the area, which shows “Brick Kilns” just south of the village of Funtley, and “Fareham Kilns” a little to the east. 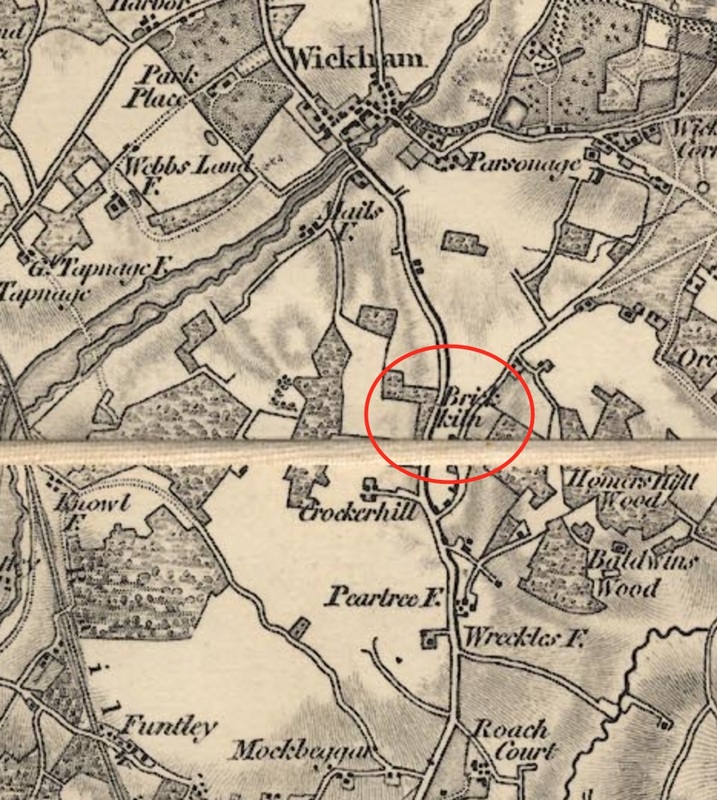 On the Ordnance Survey Old Series map of Hampshire for this area, dated 1855, a “Brick Kiln” is also shown on the road between Fareham and Wickham. The village called Funtley (from the Anglo-Saxon, “Funtaleg”, meaning “Springs”), also spelt as Fontley, was first mentioned in the Domesday Book. It’s a couple of miles north of Titchfield and is where the iron-making that I discussed in my previous post was also carried out. Funtley grew from the development of a clay quarry, the clay being used to make chimney pots and bricks. The Fontley Brick and Tile Works was, at one time, the most important in the district. Handmade bricks from here (“Fareham Reds”, a well-known red-tinged clay brick) were used in the building of Ravenswood House at Knowle Hospital (previously known as Hampshire County Lunatic Asylum) and, more famously, in the construction of the Royal Albert Hall in London. The works at Fareham also supplied bricks for the forts being built around Portsmouth and Gosport and the docks at Portsmouth and Southampton in the 19th century. Fort Widley on Portsdown Hill, finished in 1868, is one of the forts above Portsmouth, built for the city’s defence from the land side and called “the best self-contained castles to be built in England”. Large amounts of brickwork were used in the fortifications and in the large dry moats. The high walls were flint faced but the corners, parapets and other defensive buildings were built of Fareham red bricks. 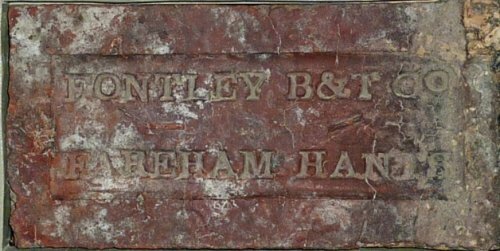 The Funtley company produced hand-made bricks from the mid-19th century up to 1923, when they moved over to mechanised production. The works closed in 1967, and the clay quarry is now a fishing lake. But even though the pit is worked out, the different colours of the clay strata can be seen: the lower bed of the Bracklesham and the top layer of the Reading Beds were used for brick and tiles. The London Clay, generally dark blue in colour, containing significant quantities of iron pyrite or marcasite, was used for making blue bricks (“Funtley Blues”, mainly used for paving). The clay was also used to produce art pottery of a standard high enough to be presented to Queen Victoria. At one time the works was producing red bricks, blue bricks, roofing tiles, floor tiles, terracotta objects, art pottery, copings, channelling and drain pipes. But it was hard work for some! A man who worked as a “clay digger” at Funtley after the Second World War, with his mate, dug twenty tons of clay a week and got £4 a week in wages… (http://titchfieldspirit.btck.co.uk/PeoplesStories/AndrewMills). Another important brickworks, quite close to Titchfield and Funtley, was at Bursledon. It was founded in 1897 by the Ashby family, where abundant clay was known at the site and very good transport links by both rail and river were available. The clay was originally dug by hand in pits close to the buildings. The clay pits were deep – nearly 40ft – and very extensive. The clay was brought back to the factory using narrow gauge railway wagons, but eventually the pits were too far away for this to be practical. Mechanised digging started in the 1930s. Eventually the local clay was worked out, and the site closed in 1974. Now, the lakes form a nature reserve, and the buildings are a museum of the brick-making industry. Brick-making also took place in other villages in the Meon Valley. In Soberton, for example, ten miles north of Funtley, clay from the southern part of the village was used for making bricks for centuries. In 1741, a brick kiln was recorded in a house in Soberton, when a certain John Pafford occupied a house with a kiln in his garden. A century later, his descendant, William, who lived in an area of Soberton called Charleswood, was described as a brick-maker on both the 1841 and 1851 censuses. In 1678 and 1701, the Gisby brothers, William and John, were referred to as brick-makers as well as farmers. Names of locations in the village – Kiln Hill, Clamp Farm and Clamp Kiln Farm – also indicate areas of brick-making, and there is evidence from trade directories of brick-making in the village right up until the mid-20th century. Brick-making has not been a huge industry in the Meon Valley, but certainly one of significance, and how fascinating it is once again to follow the clues left by the past to learn how our forebears made their living. Do you have any other information about the Pafford's, I know Philip Pafford of Soberton was also involved in brickmaking in the 1700s. Do you know what the relationship between John and William was? Thank you so much for your comment, Rach. I'm so glad you enjoyed the article and I'm sorry I didn't pick your comment earlier. No, I'm afraid I don't know anything more about the Paffords. Are you a descendant of the Pafford family? My post this month for The History Girls is all about Soberton, which you might find of interest. But nothing more about the Paffords, I'm afraid! Thank you for your very interesting article. I’m particularly interested in the history of Fontley brick-workings as I live in a cottage of indeterminate age which is located at the entrance to Holly Grove at the top of Funtley Hill. I have recently combined my Cottage (3 Holly Grove) with what was number 4 and have been combing through the deeds of 4 which go back to the mid 19th century. It appears the works were owned by Thomas Marsh until his death around 1867. I’m wondering if you have access to more detail of the history of the Holly Grove Kilns that you could share with me. For my part, if you are interested in deciphering 19th century legal documents, I’d be happy to share what I have with you.